DUET Group received acceptances for 67 per cent of the securities offered under the retail component of its rights issue, indicating a high level of support in a tough share market. The one for five offer was underwritten. The institutional component, which raised $173.8 million, was oversubscribed, and the underwriters obtained oversubscriptions from institutional investors for the securities not taken up under the retail offer. Together with $102.7 million from the retail offer, DUET raised in total $276.5 million. Energy World Corporation lifted its net profit after tax to US$27.8 million in 2010-11 from US$20.3 million in 2009-10. Basic earnings per share rose from 1.29 US cents per share to 1.74 US cents. Sales revenue rose from US$ 93.4 million to US$110.3 million. Hastings Diversified Utilities Fund saw its first half net profit to 30 June rise strongly by 58 per cent to $27.1 million. Free cash flow rose 13 per cent and fully covers distributions. The calendar 2011 distribution is 10 cents per security including 5 cents per security in the first half. The fund says it remains well positioned to deliver strong and sustainable returns to security holders. Chief executive officer Colin Atkin said "The result is all the more significant as it has been achieved following the divestment of South East Water in the UK and the consequential reduction in earnings from that investment. The result underscores the intrinsic value of our gas transmission pipelines across Australia." Current expansion projects are fully funded, and on time and budget, he said. The fund has strong growth prospects supported by the dynamics of the burgeoning energy market, giving it a positive long term revenue profile. Lynas Corporation has signed a long term supply agreement with BASF Corporation for rare earths to be produced at the Lynas Advanced Materials Plant (LAMP) in Malaysia. The contract will secure a substantial portion of BASF's Fluid Catalytic Cracking business' long term lanthanum requirements. Pricing is tied to market price. Lynas' executive chairman, Nicholas Curtis, said BASF is a very important customer in the rare earths industry. "The contract is another example of how Lynas is able to stabilize the important rare earths supply chains for major industrial users." The contract is for product supplied from the Phase 1 and the Phase 2 expansion of the LAMP. Phase 1, with capacity of 11,000 tonnes of rare earth oxides per annum, is scheduled for first feed of rare earths concentrate into the LAMP in the fourth quarter of 2011. The Phase 2 schedule is 12 months after Phase 1 and will double the LAMP capacity to 22,000 tonnes per annum. Qube Logistics Holdings has been added to the S&P/ ASX 200 Index in the latest rebalance (ASX: QUB). Two Transpacific Industries directors have expressed confidence in the company's low share price with on market purchases. Galaxy Resources has received approaches by five major Chinese banks about funding its proposed Lithium-Ion Battery Project in China. Some banks have registered interest in providing indicative funding of up to US$100 million as a fixed asset loan facility and up to US$45 million in working capital. The funding needed for the project is still being established. Galaxy said that the Chinese Government's recent 12th Five Year Plan for 2011 to 2015 has targeted renewable energy usage and a significant boost in the ownership of electric vehicles. This should see a significant rise in demand for lithium-ion batteries. Galaxy's Battery Project is in a strategic mandate area and is considered an "encouraged" industry for the country. Managing director Iggy Tan said the level of interest from Chinese funding institutions is very encouraging, but the company will not consider making this decision until its main project, the Jiangsu Lithium Carbonate plant is completed. In July Galaxy finalized a technology license with US lithium-ion battery producer K2 Energy Solutions Inc, which will provide Galaxy with battery technology expertise, licensing and commercial support for the Battery Project. Galaxy's 2010 feasibility study for the Battery Project found that the production of 350,000 e-bike batteries per annum would generate expected annual revenue of $68 million and average pre-tax net cash of $30 million. The battery project contractor, M+W Group (Germany) is finalising the detailed design and an Environmental Impact Assessment Report for the Environmental Protection Board in Jiangsu Province. The factory lay-out and master plan has also been finalized, and will be included in the Safety Impact Assessment and Project Approval processes. The capital requirements for the Jiangsu Lithium Carbonate Plant, including start up costs, will be drawn from the various credit facilities. Interest is charged only on outstanding draw downs and no facility security is required. The company's has cash position of $54 million. Galaxy director non executive director Ivo Polovineo has resigned due to personal commitments, effective immediately. (ASX: GXY). Its struggling share price and capitalization would appear to have cost Infigen Energy its place in the S&P/ ASX 200 Index, with the company removed in the latest rebalance. Infigen reported a net loss for 2010-11 of $61 million. While a large amount, it is 18 per cent or $13.4 million lower than the loss in 2009-10. The result includes a loss from discontinued operations of $35 million from the sale of the German assets. This compared to a loss from discontinued operations of $7.7 million in 2009- 10 from the sale of the French assets. The improvement is "attributable to a tax benefit of $9 million compared to tax expense of $12.5 million in prior comparative period, additional net income from Institutional Equity Partnerships of $7.1 million and the reduction of one-off costs and significant items which were nil compared to $20.8 million in the prior comparative period," it said. Other factors higher post warranty turbine operations and maintenance costs, and higher borrowing costs due to interest rate swap termination costs. Wholesale electricity prices remain low in the US and Australia. Infigen expects Renewable Energy Certificate to improve steadily in the medium term but to remain around current levels through 2011-12. Infigen plans to continue to focus on improving its operational performance. On its debt issue, total borrowings fell from $1.42 billion to $1.25 billion. Infigen said cash flows from its wind farms except Woodlawn remain subject to the cash sweep of its long-term, low interest margin Global Facility. "Infigen remains on track to repay $250 million of Global Facility borrowings across FY11 and FY12 and expects to continue to meet the leverage ratio covenant test in FY12." Two Infigen directors have bought securities on market. Michael Hutchinson has indirectly acquired 110,000 securities for $28,050, an average price of 25.5 cents. AFT Corporation continued its turnaround with revenue for the half year to 30 June jumping to $13.2 million, up 170 per cent on the 2009-10 first half. Profit after tax rose 332 per cent to $799,000. Chairman Stone Wang said the first half results were boosted by a surge in sales from the 30 June deadline for the closure of the NSW solar feed-in-tariff. CBD Energy reported a 35 per cent increase in net profit to $5.1 million for the year to 30 June. Revenue jumped almost fourfold from $44.8 million to $164.7 million, thanks to revenue from subsidiary, eco-Kinetics, which overcame solar industry uncertainty, lifted market share and expanded internationally. However, basic earnings per share fell from 2.77 cents to 1.24 cents. CBD has also signed to participate in the management of AusChina Energy, a joint venture which aims to gain a third of Australia's wind energy market over the next eight years. CBD will receive an ongoing management fee for its services. CBD managing director, Gerry McGowan, said the annual results were an indicator of the potential of the business. "The appointment of CBD to participate in the management of AusChina and the growing international component of the solar business are a pointer to the changing nature of the company. We are now diversified across wind, solar and energy efficiency with a business model that makes us competitive internationally." Expansion of eco-Kinetics has turned it into two businesses - domestic and international, including large projects, he said. Despite government policy uncertainty and industry upheaval, eco-Kinetics increased its market share, the 8 MW solar project in Thailand was delivered, and work progressed on solar projects in Italy. The subsidiary is also well advanced in establishing its solar equipment manufacturing joint venture with Tianwei, with November a target date to commence production. In its first year of operation, CBD's solar brand, CBD Solar, contributed revenue of $14.5 million. Captech was profitable, is now manufacturing solar inverters, and should make a more significant contribution to earnings in 2011-12. The Parmac business returned to profit. Although there are uncertainties about state and federal government policies towards renewable energy, CBD said it continues to see opportunities in wind and solar, principally due to the cost and technological competitiveness provided by its China partners and Australia's 2020 Renewable Energy Target (RET). "When solar panel manufacturing commences, and with Captech now making solar inverters, CBD will be Australia's only fully integrated solar equipment manufacturer," said the company. AusChina intends to acquire or develop $6 billion of projects over the next eight years. CBD's management agreement entitles it to an annual fee of 0.5 per cent of AusChina's assets. AusChina expects to make its first asset acquisition in coming weeks. CBD owns 23.75 per cent of AusChina. As each acquisition is made, CBD can choose to maintain that shareholding. If it does, it can request to borrow the equity through a shareholder loan from the other shareholders in AusChina. Shares in long suspended recycler CMA Corporation are expected to commence trading on a post-consolidation and deferred settlement basis on 6 September, and on a normal settlement basis on 20 September following the company's rights offer and $77.5 million recapitalization. The Retail Offer saw 4.17 billion shares offered, of which 995 million were taken up. The raising was underwritten, which may lead to an overhang when trading commences. The earlier Institutional Offer issued 3.05 billion shares. All shares will be consolidated on a 40 to 1 basis before trading recommences. CMA made a net loss for 2010-11 of $123.6 million. The 2009-10 loss was $72.4 million. Adjusted earnings before interest, tax and depreciation (adjusted EBITDA) was $4 million, lower than the $11.9 million adjusted EBITDA in fiscal 2010. CMA said it achieved a significant second half turnaround of almost $9 million versus the first half loss of $5.3 million due to benefits arising from a comprehensive restructuring that commenced in January. The annual result includes impairments of $58.7 million comprising further write-downs on plant and equipment and goodwill. DoloMatrix International is to pay a fully franked dividend of 2 cents per share, and has seen its share price hit a one year high of 28 cents following a 16.7 per cent increase in annual profit to $4.01 million. Operating revenue rose 14.3 per cent to $33.8 million. Basic earnings per share rose to 2.93 cents from 2.51 cents. Energy Developments has completed the acquisitions of Energy Generation Pty Ltd (enGen) from Wesfarmers for $101 million. enGen owns and or operates 98 megawatts of power generation capacity at Australian mine sites and remote communities. The acquisition takes Energy Development's Australian portfolio to 538 MW. The company said it traded profitably in the second half, but recorded a 9 per cent fall in full year revenues to $28.3 million. First half performance was adversely impacted by a cyclical decline of over 50 per cent in the its traditional Air Pollution Control products business and by Queensland flooding in late 2010 and early 2011 which saw delays and deferment of mining services projects. Emerging demand in the second half for mining services and air pollution control offerings saw revenues and profitability improve. "In particular, recovery from the devastating Queensland floods earlier this year has driven demand for the Company's mining services particularly in the Bowen Basin were EGL now has two facilities at Emerald and Moranbah," said chairman, John Read. "A return to more normal trading conditions in the company's particulate removal business unit, TAPC, has seen a return to historic trading conditions with before tax profitability in the order of $1 million for the full financial year." Greencap had a poor 2010-11 with a net loss after tax of $5.6 million compared to a profit in 2009-10 of $4.3 million. The key component of the result was a loss from discontinued operations of $9.4 million. The net profit from continuing operations was $3.8 million compared to 2.9 million the previous year. Revenue grew to $58.9 million from $53.3 million. The continuing operations are the risk management consulting business operations now incorporating Noel Arnold and Associates, Trimevac, MC2 Pacific, ENV Australia, ECC, AEC Environmental, ENV Asia and PT ENV Indonesia. The continued operations grew both in revenue and earnings. Quantum Energy had a disappointing 2010-11 with net loss after tax of $9.8 million compared to a 2009-10 profit of $8.4 million. Revenues decreased 46 per cent from $81.2 million to $43.8 million. Net tangible asset backing at 30 June was 1.45 cents, down from 2.85 cents. Directors said they are disappointed with the result. "The company experienced a challenging year with Environmental Services Division impacted by the significant uncertainty and changes concerning the level of government assistance provided to consumers in the renewable energy sector." During the year, the company established a retail Solar Division to distribute and install photovoltaic products for consumers, but significant losses were incurred due to uncertainty and regulatory changes in the sector and in June the division was closed. "A recent improvement in sales activity has been noted and the company expects this improvement to continue through financial year 2012 as the uncertainty subsides. Quantum is expecting the Environmental Division to return to profitability with a renewed focus on sales and distribution channels to support business within Australia." says the company. Despite record revenue of $53.7 million, Solco had a reduced net profit in 2010-11 of $2.4 million compared to $4.8 million in 2009-10. Pre-tax profit was a record of $3.6 million. Earnings per share fell to 1.23 cents from 2.4 cents. The company's 56 per cent growth in revenue to $53.7 million was driven by the success of its Products division, which wholesales solar products, and the expansion of its Projects and Power Divisions. Executive chairman David Richardson said the results reflect the company's national footprint, wide range of solar products and its strategy of growing the business beyond the residential market into the development of commercial scale solar installations and projects. "Our strategy is proving successful and it remains unchanged for the coming year. We will continue to build our wholesale division while increasing our market share of gridfed power generation through larger scale commercial installations and build-own-operate power generation projects through strategic joint venture partnerships," he said. "After 25 years in the industry our experience, scale and strategy has given us the ability to make the most of growth and weather any challenges in the sector. As Government Solar programs are devolved we anticipate a reduction in the products consumed by the residential solar market, but with steadily rising power prices and solar energy coming closer to grid-parity, the time is now right for the commercial PV market to expand." AnaeCo has made some significant changes to its board, with the retirement of professor Michael Dureau as chairman and director, the retirement of Richard Rudas as a director, and the appointment of Shaun Scott as chairman. Professor Dureau has been a director since August 2005 and chairman since August 2009, and was instrumental in forging the relationship with the infrastructure investment fund of Perpetual Ltd which later became Palisade Investment Partners. Professor Dureau will remain involved with AnaeCo in an advisory capacity. Richard Rudas was a founding director and was appointed to the board in April 1999. From April 1999 to May 2006 he was managing director. As a co-founder of the company, he has been involved in every aspect of its development, and as the senior engineer throughout that period made a significant contribution to the engineering development of the DiCOM technology. He will remain as an employee in a senior advisory role until September 2012. AnaeCo has finalized a short term loan facility with Bizzell Capital Partners Pty Ltd (BCP) for $1.445 million. The facility will fund working capital until further funding initiatives are completed. management company to reach agreement on the convertible bond as announced n 30 June. Chairman professor Michael Dureau said "We are disappointed not to have reached agreement on the convertible bond with the fund after signing the term sheet, but given the volatile state of international markets recently it is somewhat understandable. More importantly we are very pleased to have BCP's support via this loan facility which will meet our short term cash requirements, while we conclude longer term funding initiatives currently underway." In a management restructure, Australian Renewable Fuels has appointed Andrew White as managing director and chief executive officer. Current executive chairman, Tom Engelsman will continue as executive chairman to November and then hand over to Philip Garling, who will be the independent non executive chairman. Mr Engelsman will then continue as a non executive director. Carbon Conscious enjoyed a 179 per cent increase in profit in 2010-11 to $886,317. Revenue was up 2.4 per cent to $7 million. "In the 2011 year, the company benefitted from the continuation of long term revenue streams associated with the ongoing managing and monitoring of the tree crops planted under contract. This, together with the expansion into New Zealand and a number of smaller local contracts, added to the ongoing profitability of the company," it said. Universal Rare Earths Pty Ltd, a subsidiary of Datamotion Asia Pacific, is withdrawing from the Mt Barrett Farmin and Exploration Joint Venture. URE has not earned any interest in the Mt Barrett Project tenement EL38/2053. Datamotion said it continues to focus on its primary business of information technology solutions and the review of potential synergistic acquisition opportunities. It is also reviewing its involvement in the remaining Moruya and Pambula joint venture farm-in agreements. Dyesol saw it net loss increase in 2010-11 by 20 per cent to $17.28 million. The implementation of the Dyesol employee share ownership plan resulted in almost half of the increased loss attributable to non-cash items. Other non-cash loss items of significance were an increase in forex losses as the Australian dollar continued to appreciate. On the positive side, there has been a gradual decline and stabilisation in the company's monthly cash burn over the past six months - three months either side of the end of last financial year. Marketing related expenses including travel and consultancies expenses were reduced. EcoQuest's has added to the retail distribution for its Little Takas nappy and baby wipes range with the Metcash network in Australia and the National Childbirth Trust (NCT) online store in the UK. Metcash, said to be Australia's leading marketing and distribution company in the grocery, liquor and hardware wholesale industries, will include the products in its national distribution network. In addition to distributing through its national warehousing and logistics supply chain, Metcash will also promote the products to its 1,300 IGA stores. "This agreement is a major step forward in fast-tracking our national retail presence as many IGA stores prefer to deal with Metcash for all their products rather than with individual suppliers," said EcoQuest's global managing director, Keith Herbert. The NCT is the UK's largest charity for parents and campaigns as the voice for parents on parenting issues including on the environmental impact of disposable nappies. The products will be available for purchase through its on-line store. In another blow to the geothermal sector, Geodynamics has made a loss of $120.8 million for the year to 30 June 2011. Net tangible asset backing per share has fallen from 92.2 cents to 45.9 cents. The huge loss is based on write downs - $87 million in total impairment expenses for well assets outside of the Habanero location, and another $33.5 million for drilling rig assets. The historical costs of the wells drilled at the Savina and Jolokia sites were expensed as the company does not have any plans to continue operations at those sites in the immediate future. Managing director Geoff Ward said Geodynamics' focus is to tightly focus activities for the next steps of the Innamincka Deeps Joint Venture work program at the Habanero location. This is the site of Australia's first successful enhanced geothermal system fracture network. The focus is on proving the value immediately around the Habanero location and demonstrating commercial capability from that site in the short term, he said. This is also consistent with the company's funding under the Renewable Energy Demonstration Program. The work program is now being finalized with joint venture partner, Origin Energy. "The immediate milestone of the proposed program is to commence drilling the next Deeps well, Habanero 4 during the 2012 financial year," he said. The Rig 100 and Rig 200 assets were written down as the global market value for rigs has declined and the Australian dollar has strengthened considerably. Hot Rock has announce an estimated Inferred Geothermal Resource at its Longavi project in Chile of 5400 petajoules. This is sufficient for 135 MWe of electrical power generation for 30 years and would meet the electricity requirements of about 150,000 Chilean households. Longavi is the company's second defined geothermal resource in Chile, following the 7,400 PJ inferred resource at the Calerias project that was announced in July. Longavi is the third project to have geothermal resources publically declared in Chile to date. Intec had a good 2010-11, turning around a loss of $1.7 million into a profit of $1.5 million. Revenue more than tripled from $549,000 to $1.77 million. Basic earnings per share were 0.83 cents. Intec said the profit was principally due to the monies received from the agreement with JX Nippon Mining & Metals Corporation. "Both Intec and JX Nippon have patent portfolios in the field of halide-based hydrometallurgy for the processing of base and precious metals. Under the Agreement, Intec and JX Nippon have cross-licensed each other with certain patents, inclusive of a $5.0 million payment by JX Nippon to Intec," it sad. 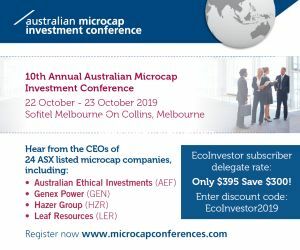 "Revenues from continuing operations were generated from fees received from clients for ongoing hydrometallurgical process development testwork, the ongoing recycling operations at Burnie, production and shipping of low-grade zinc concentrate blended from the Group's stockpiles of Zeehan feedstock and Tasmanian EAF dust, interest from the Group's environmental bonds for the EAF dust stockpiles and other minor sources." Intec said it has received multiple enquiries about the possible application of the Intec Process to the recovery of rare earth elements from mineral and industrial feedstocks. Preliminary testwork on a neodymium (Nd) and dysprosium (Dy) rare earth-bearing waste feedstock has so far been successful. Testwork suggests the process could leave a benign solid residue. MediVac is to sell its non core Tracesmart technology after failing to find a commercialization partner for Diakyne. "The company believes it more prudent to sell and accordingly, after taking advice from an independent valuation expert, has taken an impairment charge of $343,049 in the FY 2011 accounts against the carrying value of the Diakyne subsidiary and the Tracesmart technology," said executive chairman, Paul McPherson. Mr McPherson has indirectly acquired 5 million shares with a cost of $15,000. The average price was 0.3 cents. Nanosonics saw its revenue jump 93 per cent in 2010-11 from $1.7 million to $3.3 million. Revenue from the sale of goods rose more - from $763,000 to $2,24 million. Updating the market on its Salar de Olaroz lithium project, Orocobre said the due diligence process by Toyota Tsusho and the Japan Oil, Gas and Metals National Corporation (JOGMEC) has been completed without material issues arising. The terms of arrangements with Toyota Tsusho are expected to be completed in the fourth quarter of 2011. Toyota Tsusho Corporation is a strategic partner and is arranging debt finance for a minimum 60 per cent of the capital needed for the Olaroz project through a low-cost debt facility to be guaranteed through JOGMEC. A search is underway to find a replacement director. For 2010-11 Pacific Environment recorded a profit of $1.6 million. In 2009-10 the company made a loss of $1 million. Operating revenue rose to $9.3 million from $7.2 million. Phoslock made a loss for 2010-11 of $4.1 million compared to a loss of $1.8 million in 2009- 10. The result includes a non-operating impairment write-down of $2.1 million on intellectual property. The directors said the long term value of the intellectual property is unchanged, but by writing off its value, future reported earnings will more appropriately reflect the actual profitability of the company. "In future years the company will benefit through lower amortisation charges of approximately $350,000 per annum," it said. The directors said the company is debt free and has consolidated cash and trade receivables totalling $1.3 million. There is no need or intention for the company to raise equity in the foreseeable future, it said. Style is to conduct a non-renounceable rights issue to raise up to $2.1 million, of which $1.8 million is underwritten. The one for one rights issue will be at 0.3 cent per share. Every two shares issued will come with one free option with an exercise price of 0.5 cent and an expiry date of 31 July 2014. Style has appointed Peregrine Corporate Ltd as underwriter. Peregrine will be paid a fee of 5 per cent of the total sought to be raised under the issue, and receive 50 million options with the same terms as the free-attaching options. The funds will mainly be for working capital, marketing support for the launch of Style's strand woven eucalyptus products and further investment in research and development to enable international licenced manufacturing. Style has entered into secured loan facilities with several lenders and obtained loan funding of $1.1 million. The lenders have agreed to sub-underwrite a portion of the rights issue. To the extent there is a shortfall in acceptances, the loans will be partly or fully satisfied by offsetting an equivalent amount of the lenders' sub-underwriting commitments as a proportion of the total underwritten of $1.8 million. Should the loans not be repaid by offsetting sub-underwriting commitments, funds raised by the issue will be applied to the discharge of the loans. WAG is seeking to raise $5 million to complete the acquisition of waste management technology company Pacific Pyrolysis Pty Ltd (PacPyro). The offer opens on 2 November and closes on 16 November. The capital would accelerate the commercial scale deployment of the technology through the development of strategic relationships with large international companies and institutions, said WAG. PacPyro's technology delivers sustainable and value add waste management outcomes including renewable energy, biochar and carbon reduction. On completion of the acquisition, a new board will be appointed comprising Keiran Wulff, Michael Ottaviano, John Glen, Peter Mann and Adam Townley. This board is said to have significant experience and expertise in the commercialization of the PacPyro technology. Non-executive chairman Dr Keiran Wulff has 25 years of international operating experience in the energy industry and was chief operating officer of Oil Search Ltd. Non executive director Dr Michael Ottaviano is managing director of Carnegie Wave Energy. Ocean Power Technologies said it PowerBuoy unit successfully withstands Hurricane Irene that hit the US east coast last month. The PowerBuoy unit was deployed off the coast of New Jersey and was in the direct path of the hurricane. "The PowerBuoy emerged from the two-day storm undamaged and fully operational, with all the buoy's systems having withstood wave heights of up to 15 metres. During the storm, the PowerBuoy continued to supply consistent power to its communications and radar payload, and dissipate the high amounts of surplus energy it produced," said OPT. Near constant communication was maintained with the device throughout the storm, allowing on-land monitoring of its status and performance.